6.0 earthquake hits the Molucca Sea. 5.4 earthquake hits Sulawesi, Indonesia. 5.3 earthquake hits near the coast of Nicaragua. 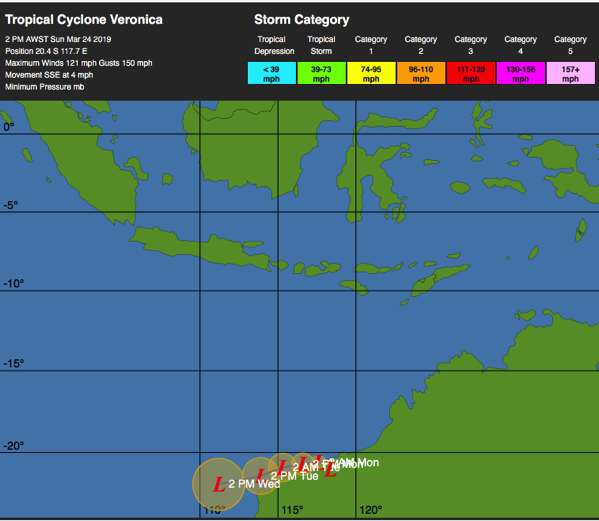 In the Southern Hemisphere: Tropical cyclone (tc) 21s (Veronica), located approximately 231 nm east-northeast of Learmonth, Australia, is tracking south-southeastward at 04 knots. Tropical cyclone 22s (Joaninha), located approximately 311 nm northeast of Port Louis, Mauritius, is tracking northward at 02 knots. Mozambique – Update – Mozambique reported scores more deaths on Saturday from a cyclone and floods around southern Africa that have killed at least 732 people and left thousands in desperate need of help, many on rooftops and trees. Cyclone Idai lashed the Mozambican port city of Beira with wind s of up to 170 kilometres per hour (105 miles per hour) last week, then moved inland to Zimbabwe and Malawi, swamping populations and devastating homes. In all three countries, survivors have been digging through rubble to search for victims, and scrambling for shelter, food and water, while governments and aid agencies rush in help. Illinois, USA – Floods hit hundreds of homes, businesses in northern Illinois. Emergency responders continue to monitor flooding in Winnebago and Stephenson counties as river levels slowly recede and the recovery process begins. The Rock River was at moderate flood stage Friday afternoon in Rockton and Machesney Park after cresting above major flood stage levels on Monday. Flooding affected 502 homes and businesses in Winnebago County and 316 of them are in Machesney Park.